The Roth IRA has rules that benefit investors of all ages. If you're young and need extra cash, you may be able to extract Roth IRA contributions (tax- and penalty-free) to pay for a new house, car, or bicycle; if you're retirement age, you may be able to withdraw money without paying taxes. Plus, there are beneficial rules for those who are between starting out and spending down assets. I can withdraw contributions from a Roth IRA without paying taxes or penalties. Being able to retrieve money I've contributed to a Roth IRA without paying taxes or penalties is a fairly unique feature of the Roth IRA. Most likely, the IRS allows such tax- and penalty-free withdrawals because I paid taxes on the income contributed to the Roth IRA in the first place (unlike my potentially deductible contributions to a traditional IRA or traditional 401(k) plan). To fully use this feature, understand the difference between contributions and earnings. Contributions are the amounts of money I put into the Roth IRA each year. My earnings represent the growth of the account due to dividends received on stock investments and growth in the value of my investments due to stock price increases, etc. For example, if I've contributed $2,000 for six years, then I've made $12,000 in contributions. If my investments are now worth $20,000, then my earnings are $8,000. I can take out up to $12,000 without paying taxes or penalties. Note that this withdrawal or distribution is considered a type of non-qualified distribution that happens not to be taxable. Because of this feature, I may be able to use money in my Roth IRA for purposes other than retirement. For example, I could pull out contributions to make a down payment on my house or pay for my kids' college education. Though I don't recommend spending retirement dollars on non-retirement needs, this approach may be preferable to borrowing against my 401(k). I need to remember to keep excellent records about contributions plus consult a tax expert before making this move. I can withdraw earnings from my Roth IRA before retirement tax- and penalty-free if my account meets the 5-year rule plus more specifications. Further, I need to use the money for a qualified reason, such as buying or building a first-home (with up to $10,000 available without taxes or penalties), disability, or death (in which case money goes to beneficiaries without taxes or penalties). I may be able to tap earnings for educational and medical expenses without owing 10% in additional taxes. These situations are complex so check with a tax professional before taking an early distribution. There are no required minimum distributions (RMDs) with Roth IRAs. I can leave my money in the Roth IRA indefinitely as I don't have to take RMDs. My money can continue to grow tax-free within the account. Also, I don't have to worry about making these withdrawals according to a certain schedule, giving me flexibility in terms of timing the sale of investments. I can contribute to a Roth IRA past the age of 70.5 years. If I'm late in building retirement assets (or just want to accumulate more), I can continue working and contributing to a Roth IRA indefinitely. So, if I'm planning to live past 100, I can work in my mid and late 70s, set aside money for my eventual retirement, and shelter earnings from taxes on capital gains and dividends. I can contribute to a Roth IRA even if I have a retirement plan at work (as long as my income is below certain thresholds. The presence of a workplace retirement plan doesn't affect my ability to contribute to a Roth IRA. The most I can contribute to a Roth IRA each year is $6,000 plus catch-up contributions of $1,000 when I'm 50 years or older (for a total of $7,00). There are a few restrictions on making contributions to a Roth IRA. Currently, for 2019, the maximum contribution to an IRA (traditional or Roth) is $6.000 annually or $7,000 if 50 years or older. Note that there are other restrictions that depend on personal circumstances but there is a general cap or maximum for everyone. Check with the IRS to determine the current year's limits. Generally, I need earned income to contribute to a Roth IRA. Though I can contribute up to $5,500 (or $6,500 depending on my age), this maximum is limited by earned income. If I have a regular, full-time job or run a business on a full-time basis, I probably will have more than $5,500 in earned income. However, if I'm a college student or have a part-time job, then my earned income may be less. So, if I make $2,500 annually from a part-time position, then my earned income is $2,500 and I can contribute only $2,500 to the Roth IRA. This set-up sounds reasonable but I may have access to extra cash, perhaps from savings from previous years or a cash gift from a generous relative that could be invested; still I can only contribute up to the amount of my earned income.There are some exceptions to this general rule and I've explained other classifications of earned income and taxable compensation in another article. Further, if I'm married, have a tax status of married filing jointly, and satisfy other restrictions, I don't have to meet this earned income standard myself and can open and fund a Spousal IRA. I can contribute to a Roth IRA only if I meet income restrictions. Though the average earner should be able to contribute to a Roth IRA without bumping up against income restrictions, I could make too much money. If I earn too much, I can't contribute directly to a Roth IRA. For 2019, contribution amounts are restricted when modified adjusted gross income (modified AGI) is more than $122,000 if filing status is single, married filing separately, or head of household; or $193,000 if filing status is married filing jointly. The income restrictions are one reason why I encourage younger people to consider contributing to a Roth IRA; when you're older and make more money, you may not be able to put money into this type of account. I can't deduct contributions to a Roth IRA. This rule is the biggest and most notable disadvantage of the Roth IRA. Unlike a traditional IRA, contributions to a Roth IRA are never deductible (note that certain contributions to a traditional IRA may also not be deductible if I don't meet certain requirements). So, I miss out on a valuable tax benefit in the year I make a Roth contribution, compared to the typical deduction often available through a traditional IRA deposit. A traditional IRA contribution can lower my modified AGI, reducing my tax bill in the year I make the contribution. As a result, I'll have more money to spend, pay down loan balances, give charitably (further lowering my tax bill if I itemize your deductions), and invest in a regular brokerage account. Typically, expects say you should decide between contributing to a traditional IRA and a Roth IRA based on whether you think your taxes will be higher or lower in retirement compared to your current tax situation. For example, if you expect your tax rate to be higher now, then you'd contribute to a traditional IRA and lower your taxes with the contribution; otherwise, if you think your taxes will be higher in retirement, then you put money into a Roth IRA. Really, it's hard to predict the future. Many people split their contributions between the Roth and the traditional account; or they let IRS rules (naturally) dictate what type of account they fund each year. Note, though, there are some additional advantages to the Roth IRA that make this account attractive, even without the tax break in the year you make a contribution. After learning about the rules that pertain to the Roth IRA, I want to start contributing to this type of individual retirement arrangement. Most online brokerage firms offer such an account and minimums can be as low as $100. If you earn too much to make a contribution or if you simply want to boost your Roth holdings, you might consider converting traditional IRA funds to a Roth IRA over time, particularly if your income is lower than usual for a time (for example, if you quit your job to earn an advanced degree or decide to test an early retirement). You may also want to opt for Roth 401(k) contributions, which can generally be rolled over into a Roth IRA without incurring taxes. I can manage funds inside the Roth IRA myself via self-directed investing (that is, I pick the stocks, mutual funds, ETFs, etc. for your account) or I can let professionals handle the details by investing with a firm like Betterment or buying a managed portfolio. Like the traditional IRA, the Roth IRA allows me to grow my investment portfolio without paying income tax on capital gains and dividends in the year they occur or are distributed. 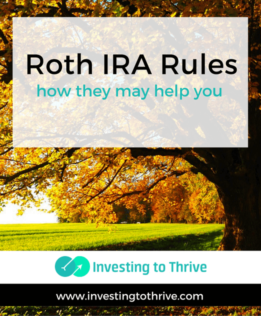 However, the unique rules relating to tax-free distributions and penalty-free early withdrawals are really what sets the Roth IRA apart.